Wild puffing of emerald trees, and flame-filled bushes. 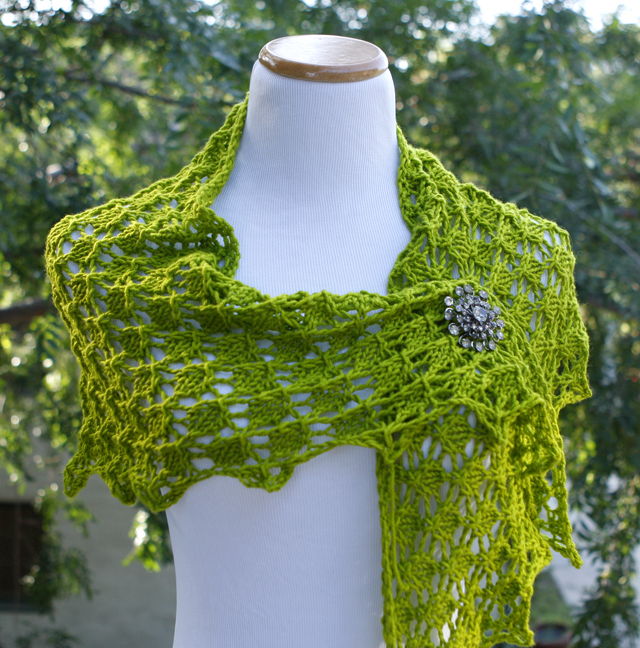 Enkindled Spring knit in Baah Shasta – Tequila lime colorway. Available on Ravelry. I started this post in the Spring. Now, I sit in my studio with the window air conditioner on high, the ceiling fan whirling, and it still is hot. Outside it is 97 degrees and heating up. Shortly after uploading the Enkindled Spring pattern to Ravelry, my family suffered a loss and I took a short break for a couple of months. Someday I will do a blog post about the wonderful man, my brother, who left us too soon. But now, I want life to return to a new normal and to share some things that bring me joy. Designing the above shawl, Enkindled Spring, was fun and I love how it knits from the bottom up. It can be any size you wish. The lace is easy to memorize and quickly knit with worsted weight yarn and US size 8 or 9 needles. The sample above was knit with Baah Shasta, a worsted weight super wash merino. I think the Tequilla Lime color screams happiness and fun. In the photo above, I wrapped one end up and fastened it with an antique rhinestone brooch (from my mom or grandmother). I love to wear it this way. The original pattern uses about 300 yards and is perfect for cool spring weather (or as protection against summer office air-conditioning). Another version I knit as a store sample for Abuelita’s Knitting and Needlepoint used Classic Elite Magnolia, a worsted weight wool and silk blend. For this one I used 2.5 skeins for 14 repeats (original has 11 repeats). I love the drape of the finished shawl and can’t wait to create another pattern using this yarn. 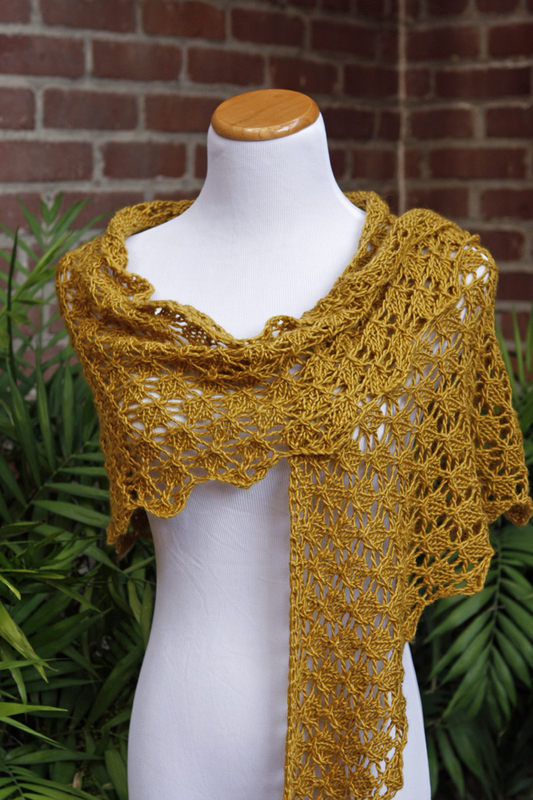 If you are looking for a quick knit, a gift for someone, or a first lace shawl, then try this pattern. And to celebrate having 4 patterns for sale on Ravelry (plus 4 free ones), enter the coupon code BLOGPOST at checkout and receive 25% off each pattern you choose in my store through midnight August 23, 2015 (Pacific Time). If you do knit from one of the patterns, please post on Ravelry or send me a photo – as a new designer it is exciting to see what others have created! This entry was posted in knitting, lace, pattern writing and tagged abuelita's knitting and needlepoint, baah, knitting, lace, shawl. Bookmark the permalink.